This was a ‘freebie’ that Clever Models offered once upon a time.. and since most people like ‘free’ then you should check the “Get Freebies” page every so often. Is there a ‘catch’ you may ask? Sure .. you download the free model and you get hooked! 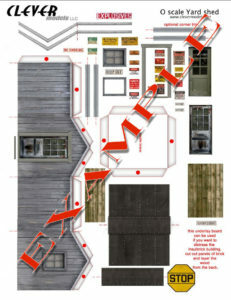 The intent from Clever Models is that you print the model out on cardstock and assemble with glue using the tabs. 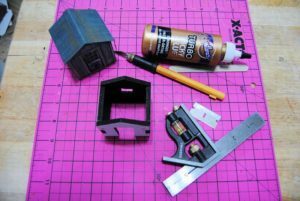 This works fine .. and be sure to review the various guides to building paper models in the Freebies page. I have my own method of constructing Clever Models kits though which I will go over. Here’s how the walls look as printed from the kit. The walls are cut out with tabs and sharply folded at the dashed lines and the base of the tabs. Not shown is an inside brace that really strengthens the kit if you build it per Clever Models instructions. My method is to cut the walls apart at the dashed lines and cut off all of the tabs. This gives me the appliqué effect I like using. I glue the printed sides to the Foamcore. I then cut the tabs and notches the depth of the thickness of the Foamcore and finally window and door openings. Foamcore can be bought many places such. 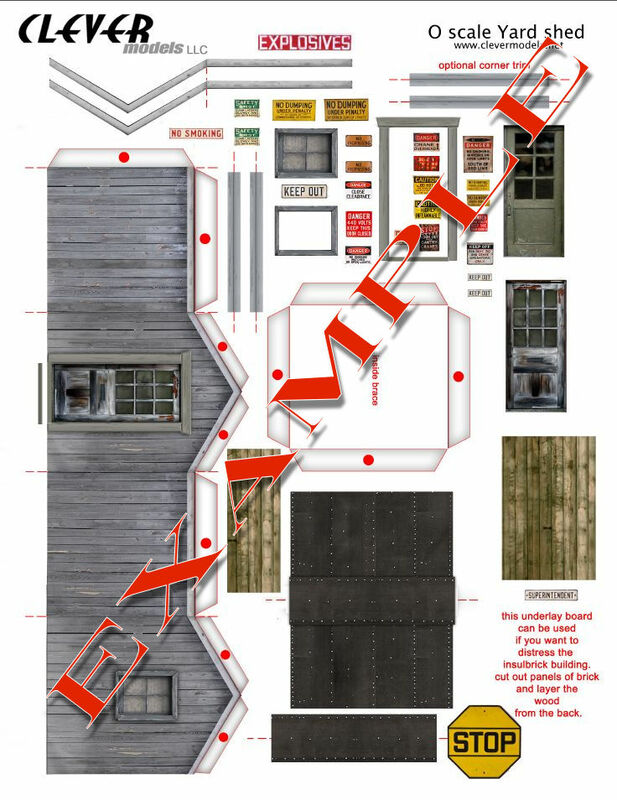 I could use a ruler and pencil to draw out the structure but I prefered to do this in Sketchup. 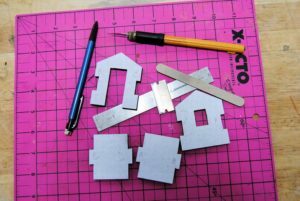 I have since figured that it is even easier to print out a copy of the structure on paper and glue that to the Foamcore and simply cut around the pieces. The matching tabs and slots are basically eyeballed. Cutting is easy with a single-edge razor blade and X-Acto blade. The slot and tab construction of the shell holds the structure together without glue giving a very solid model. Using white glue .. really like Aleene’s Turbo Tacky glue. This provides a shell .. that will provide a strong, non warping structure so the cardstock will be added as an appliqué.